Currently Spondyville's second oldest resident,* Throckmorton "Pops" DeMaupassant, at age 97, is also the oldest working Spondyvillean, as he adamantly refuses to retire from his fulltime job as the Spondyville town handyman, a job he started in January of 1947. Even the mayor seems unable to convince him that it's time to hang up his tool-belt and turn his duties over to a younger Spondyvillean. Throckmorton, or "Pops," as everyone in town knows him, is a direct descendant of one of the first settlers in the area, Zebulon Trask. Mr. Trask was a close friend of both Uriah Stoop and Elias Fuselot and accompanied them on their exploratory journey which eventually led to the founding of Spondyville. As a young man, "Pops" attended Spondyville University. He was diagnosed with Spondylitis shortly after graduation, but lived in complete denial for many years. His embracing of his diagnosis at age 27, is rumored to have come about from an epiphany after he was visited by an angel named Amariah. "Pops" has repeatedly refused to comment on this rumor, saying, "It's none of your danged business." As town handyman, “Pops” has a number of regular duties which have made him well-known to all the residents. In addition to keeping the grounds around the Spondyville Town Hall neat and trim, he is in charge of re-setting the clock atop the Town Hall, which requires a twice yearly adjustment for both to and from Daylight Saving Time. “Pops” has been handling this chore for over 50 years, and while he is still quite adept at scampering up the rickety ladder, especially for a man of his advanced years, he has gotten a bit forgetful as to what to do once he is at the top of the ladder. For the last ten years or so, a small band of volunteers, (who've come to be known as "Pops's Pups"), has accompanied him for every time change. They gather at the edge of Fuselot Park, across the street from the Town Hall, at just before 2 AM, to offer “Pops” support and vocal encouragement by yelling either, “Spring Forward” or “Fall Back” depending on the season. This tradition started in 1998, when “Pops” accidentally set the clock ahead in the fall and back in the spring, thus thoroughly confusing everyone for the entire year. 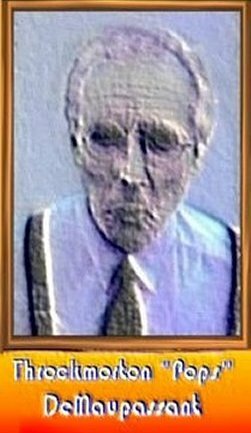 In the Autumn of 2001, “Pops” arrived for the clock re-setting after attending a marathon “Simon-Sez” contest at the Spondyville Senior Center, in the sleepy suburb of Codgertown. Upon hearing the yells of “Fall Back,” “Pops,” assuming the command was coming from “Simon,” proceeded to fall back off the ladder, executing a half-gainer in the layout position of which even Greg Louganis would have been proud. Fortunately for “Pops,” a newly purchased awning outside the mayor’s office broke his fall, and he rolled safely off into a large pile of leaves that were waiting to be composted. Part of the drama of the clock re-settings each year is finding out whether or not “Pops” will remember that the yelling of the crowd refers to what he is supposed to do with the clock and not what he is supposed to do on the ladder. So far, it's about even. “Pops” is also involved at a couple other yearly town functions: The New Year’s Eve festivities, The Fourth of July fireworks display, and, of course, the Spondyfest celebration, which commemorates the return of Stiffy the Snowspondy each November. During Spondyfest, “Pops” can always be found wearing his fashionably faux-pas-ish purple plaid beret and marching proudly at the front of the “Codger” parade. "Pops" is also a perennial contender in the annual "Apple Pie Crust-Off" contest, in which residents, (mostly drawn from Spondyville's Scalytown neighborhood) , try to eat a slice of apple pie as fast as they can without losing a single flake of their psoriasis. Every New Year’s Eve, “Pops” is the person responsible for lowering the Golden Anti-inflammatory pill on top of the Marie Strumpell building, which ushers in the new year. The giant pill, drops down the enormous neon-lit "throat" on the side of the building, eventually "eating" its way through the pulsating fluorescent "stomach lining" on the 14th floor, thus signaling the start of a another brand new year. After the disaster of 2006, "Pops" has taken to lowering the giant pill with special-grip gloves on his hands. That year, the rope "Pops" was holding slipped through his hands, sending the giant pill crashing down to the roof of the Marie Strumpell building, where it hit one of the gargoyles, broke free of its restraints, fell 40 stories into a pile of discarded Christmas trees, and then continued to bounce down Inflammation Avenue all the way to Crohns Corners, where the New Year was ushered in just as the giant pill came to rest flush up against a construction site's overturned port-o-potty. The Fourth of July has also brought its share of disasters, where each year,“Pops” has the responsibility for lighting the fireworks which are shot off in Fuselot Park. Since 2002, when “Pops” dropped all the matches he was going to use to light the fireworks into the park's fountain, he has carried in his pants pockets a dozen butane lighters supplied by the Spondyville Chamber of Commerce. In 2008, "Pops" DeMaupassant took himself off the short list of possible vice-presidential candidates to run with Stiffy the Snowspondy on the Fusion ticket, by claiming "I'm too old, and don't give a fig about such danged nonsense." At his direction, the "Draft 'Pops'" movement disbanded and apologized to the other candidates for the pre-emptive negative ads that they ran on his behalf. * Longtime friend and frequent canasta partner, Bartholomew "Skippy" Baudelaire, the Sports Reporter Emeritus for the Spondyville Times-Picayune, at age 106, remains the oldest resident of Spondyville. 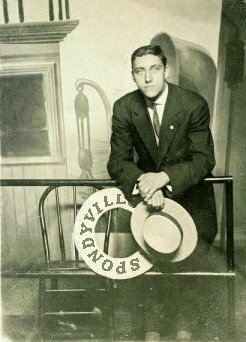 As a young man, "Pops" attended Spondyville University. 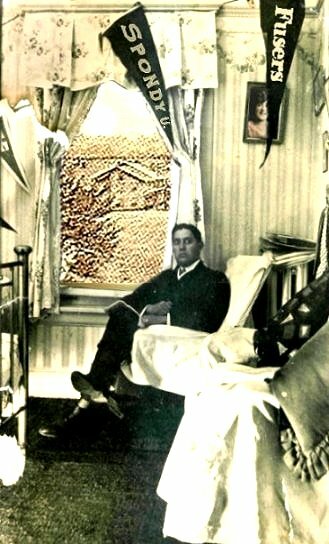 Here he is, relaxing in his dorm room. In those days, an ocean voyage was said to be good for what ails you. "Pops" helped to prove that axiom was completely wrong. 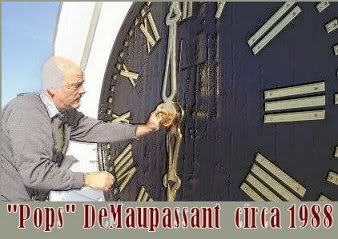 And finally, here is the only known daytime photo of "Pops", resetting the town clock. It was taken in 1988, the year he forgot to set his alarm and ended up resetting the clock the afternoon of the following day.